Bangle bracelet made of stainless steel. The Knot of Hercules ( also known as Love Knot) originated as a healing charm in ancient Egypt, but is best known for it’s use in ancient Greece and Rome as a protective amulet, most notably as a wedding symbol, incorporated into the protective girdles worn by brides, which were ceremonially untied by the new groom. This custom is the likely origin of the phrase “tying the knot.”The bracelet is open and adjustable and it fits in every wrist size. Wear alone or stack it with your other favorite bracelets. It doesn't darken. A timeless jewelr that can be worn in every occasion. Rose gold plated stainless steel bracelet. 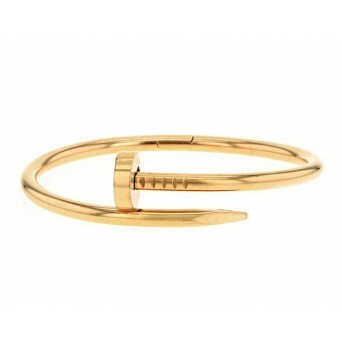 The bracelet is a flat bangle studded with screws that l..
Gold plated stainless steel bangle bracelet. 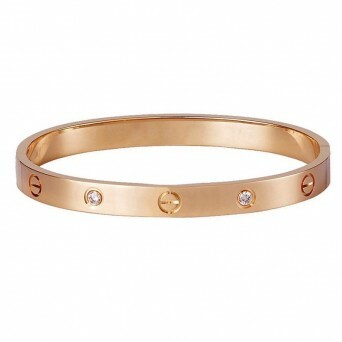 The bracelet is a flat bangle studded with screws that..
Silver, rose and gold plated stainless steel bracelets.The bracelets are flat bangle studded with s..
Rose gold plated stainless steel bracelet with crystals. The bracelet is a flat bangle studded with ..
Silver, rose, black and gold plated stainless steel bracelets. The bracelets are flat bangle studded..
Gold plated stainless steel bracelet. The bracelet is a round bangle that locks to the wrist. The br..